Déménagement en provenance/direction de San Antonio TX 78254? Obtenez GRATUITEMENT des estimations de tarif pour la location de camion au The Underdogs Unlimited. Les camions de location U-Haul sont spécifiquement conçus pour déménager des familles et non pour transporter des marchandises. Nos camions de déménagement possèdent plus de particularités de sécurité que tous les autres camions de déménagement de l'industrie, incluant une suspension pour un roulement en douceur et des rétroviseurs offrant une grande visibilité afin d'aider le conducteur. Que vous déménagiez d'un petit appartement ou d'une grande maison, le service de location de camions U-Haul à San Antonio, TX vous offrira la location de camion de déménagement dont vous avez besoin pour vous rendre du point A au point B. Trouvez le camion de déménagement de la taille parfaite pour vous aider à déménager chez U-Haul, qui offre la location de camion à 19,95 $! Les fourgonnettes et camionnettes de location U-Haul de San Antonio, TX sont idéales pour les projets d'amélioration domiciliaire, les livraisons et d'autres petits chargements. Louez une fourgonnette ou une camionnette pour économiser lors d'un déménagement ou de livraisons de courte distance. La location de fourgonnettes et de camionnettes est très populaire auprès des entreprises locales et des étudiants, comme pour les petits déménagements résidentiels à San Antonio TX 78254. Nos fourgonnettes de déménagement en location sont équipées de la climatisation, de barres de protection pour protéger vos biens et d'une attache pour remorque de location. 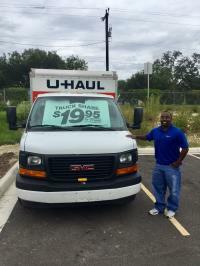 U-Haul offre des fourgonnettes de location à 19,95 $ à San Antonio, TX; réservez une fourgonnette pour votre déménagement chez The Underdogs Unlimited! We had the truck for 3 hours and moved a brand new clean sectional. They charged us a $25 cleaning charge because there was "debris" on the floor. Supposedly they sent us pictures on our receipt and said pictures were not there. The man was not helpful at all. $100 to have a 15 foot truck for 3 hours. Ridiculous. When I called to make my reservation, I believed that I specified that I wanted to pick the 10 foot truck up at 3817 Parkdale Street in San Antonio. Because I don't have a vehicle, I was already having to ask someone else for a ride & help loading the truck...for which I had no money to pay them, being on a tight budget. Yet, I needed to move my belongings closer to me. As it turned out, I had to go 15 miles out of our way to pick the truck up at the 6923 W. Loop 1604 location. Though I was given mileage credit for the inconvenience to me, the extra distance added more inconvenience to my help's busy schedules. After returning to Temple...Sunday, November 18th, I received a notification to return the truck to the location on Range Rd., which is even further away from the 2 locations I was told I could drop the truck off at when I returned it. On any given day people are generally busy, & or simply unavailable for whatever reason...on a "football Sunday" it's almost impossible to get help unloading & returning a truck. Again, my budget was very tight, yet, I had to get this done a.s.a.p., & be ready for my 10-hour workday Monday morning. When I made the reservation, I was quoted a total of $180.00 for the truck, which included a $10 fee. At the pick up location, I was told I'd be paying $198.00 AFTER TAXES. No on had mentioned the addition of any tax prior to that moment...yet, I needed the truck THEN! When I returned the truck at the Temple location, we were all pressed for time, so I had to leave & stated that the receipt could be emailed to me. I was told that I was to be billed by the pick-up location, then I was told that I was to be billed at the drop-off location (which made more sense). As it turned out, it almost wreaked havoc on my account, because the payment didn't clear as quickly as it should have (based on the timeliness of my financial institution's processing practices/protocol). I had kept checking my account balance to take care of other things (knowing what I had to work with)...I thought the amount had already been deducted & it hadn't. By the time I realized this fact, I had to make a quick adjustment...By The Grace Of God I was able to avoid added fees. Yet, I did have to pay for the adjustment. IN THE FUTURE It Would Be Good Business Practice To INCLUDE TAXES & ANY OTHER ADDED COSTS WHILE QUOTING RENTAL CHARGES...Whether On An Unlimited Income Or Strict Budget...It Shows Genuine Concern To Customers. The Practice of Having Customers Pick Up & Return Rentals To Out-Of-Their-Way Locations Is Un-Ethical & Overrated.